This white paper provides a comprehensive insight into the Nauticus Initial Coin Offering (ICO), running from March 31 to July 18, 2018. 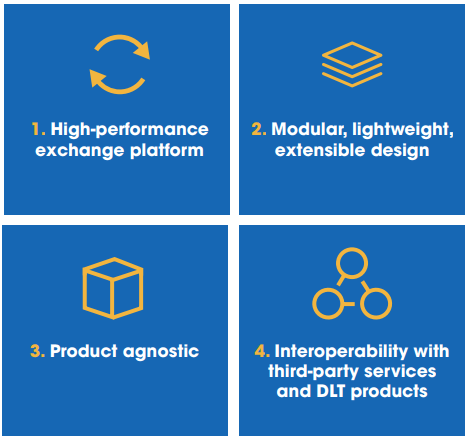 One coin for six innovative solutions, aimed at all types of users, from individuals to businesses, and every level of government. The Nauticus crypto and fiat currency exchange is in development and due to open in August 2018. It will trade in 100 cryptocurrencies at launch, and more than 300 within 12 months — including Bitcoin, Ethereum, Ripple, Nauticus Coin and many others. Nauticus Coin users will receive 50 percent discount on trading fees in the first year, which will spur the adoption of the coin and support its value. More than 200,000 users registered in the first five weeks after the project was publicly launched. Nauticus will also establish a sustainable blockchain mining center in 2019 to provide revenue, along with sizeable server capacity to ensure ultra-fast processing for users of Nauticus services. Profits from the exchange and mine will be reinvested in the business to support the subsequent development of a low-cost eCommerce platform, along with merchant and peer-to-peer payment options. The company will also develop a ‘one and done’ Know Your Customer (KYC) verification service and create an ICO community with a range of resources and services for new ICOs along with a quality verifcation system. The Nauticus Coin will underpin all of these exciting solutions. The ICO target is $68 million and the soft cap was exceeded during the presale period. The ICO will run until the hard cap of $88 million has been reached, or until the conclusion of the ICO on July 18, 2018. Cryptocurrency exchanges pose a high barrier to entry for everyday people. They’re bafflingly complex for novices and most exchanges provide for just a single fiat currency — if they allow for fiat at all. Users often need to sign up to half a dozen exchanges to be able to buy all of the different altcoins they wish, resulting in hefty fees moving from fiat in one marketplace, to crypto in another. Cryptocurrency is hard to spend in the real world and the industry is poorly regulated with attendant risks to user funds. Solving these issues presents enormous opportunities. The total market cap of cryptocurrencies increased from $26 billion a year ago to around $350 billion today. With 100,000 new users signing up to exchanges each day, and major players such as Binance earning hundreds of millions in fees, there are unprecedented prospects to capitalize on this explosive growth. Increasing regulatory oversight will provide security and stability, and spur mainstream adoption. 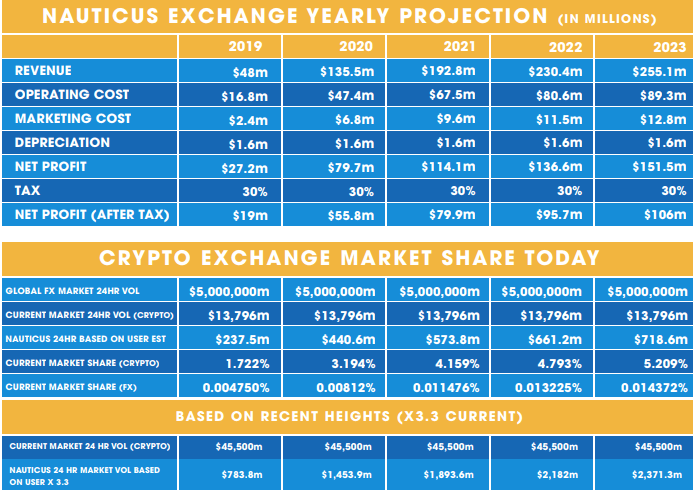 The Nauticus Exchange is designed to be the only exchange users ever need — a one stop shop offering 300 cryptocurrencies and 16 fiat. Users from around the world will be able to buy whatever crypto they wish using their own nation’s money. 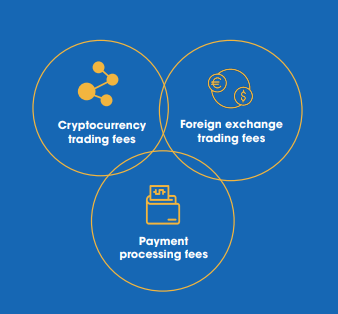 The Exchange will also enable users and merchants to send and receive payments internationally — like PayPal and Western Union combined, but with much lower fees and live market rates. More than 200,000 users have already signed up to the platform and Nauticus is registered with Australian Government regulator AUSTRAC. Crypto and fiat currency exchange. High-speed secure currency exchange, enabling ICO backers to immediately trade Nauticus Coins with 100 crypto and six fiat currencies at launch (more to be added). In development and scheduled to open in mid-2018. Green blockchain mining center. Establish an environmentally friendly mining center that provides cheaper and faster transactions for Nauticus users, generates revenue to further expand our operations, and provides a social benefit for developing economies. eCommerce platform. Marketplace with easy-to-use mobile interface enabling instant payments in any currency, crypto or fiat - underpinned by the Nauticus Coin. Ultra-low listing and payment fees, high security and detailed rating and accountability system. Merchant payments platform. Comprehensive business solution with instant payments settlement, contactless payment methods via NFC, QR, ApplePay, AndroidPay and low fees down to 0.1 percent. Analytic support for enterprises and governments. Peer-to-peer funds transfer. Global KYC verification. Become a global partner in a new system of Know Your Customer identification, in which users are verified just once. Users control the sharing of sensitive data through biometric authorization, enabling the provision of only relevant information to businesses, governments or organizations on request. ICO gateway. Establish resources for new ICOs including IT, financial, legal, marketing and HR assistance. Launch ICO register and quality seal of approval. This will support both the blockchain community and help to protect investors. Add new ICO coins to Nauticus Exchange.